Attorney General Loretta Lynch thanked members of the Baltimore Police Department for their work after more than a week of riots and protests following the death of Freddie Gray disrupted the city. “I have watched the police of this city, and I know that there are difficulties. I know that we have struggles, and we are here to help you work through those struggles in the way that will hopefully be the best and most productive way for this department. But to all of you who are on the front lines, I just want to say thank you,” Lynch said Tuesday. The brand-new attorney general, who was sworn in last week, made her first trip to Baltimore today. The Justice Department is conducting a civil rights investigation into Gray's death and a review the city's police force, which has paid nearly $6 million since 2011 to settle claims of police brutality, according to a Baltimore Sun investigation. Her visit also comes days after Baltimore's top prosecutor announced criminal charges against all six officers involved in the arrest and ensuing situation that led to Gray's death. But Lynch's words Tuesday were friendly, thanking the police for allowing peaceful protests and helping people to rebuild and clean up. “You really have become the face of law enforcement. Now you may say that's for good or ill, I know, but we don't always choose moments. Sometimes they choose us. And how we live with that and how we go through with that, determines what kind of officers we are,” she said. 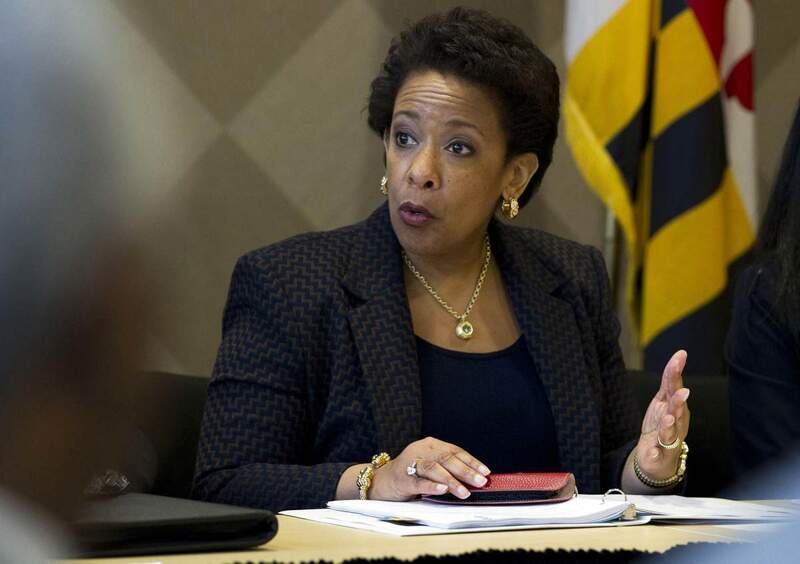 Lynch also met privately with Gray's family at the University of Baltimore, and participated in a meeting with faith and community leaders as well as a few members of Maryland's congressional delegation. Lynch's biggest challenge as the top law enforcement officer in the country is striking the right balance between supporting the community while also supporting law enforcement. When former Attorney General Eric Holder traveled to Ferguson, Missouri after a black teenager was shot by a police officer, he was criticized for seeming to “tip his hand” too far. Lynch appears to be making a deliberate attempt to hear from both sides to avoid the same perception. Rawlings-Blake likened the relationship between the police and the community to a marriage. “Separation is not an option. Divorce is not an option. We have to figure out how we're going to make this marriage work, make it healthy and make it thrive so that our city can thrive,” she said. CBS News Producer Paula Reid contributed to this report.